I almost didn�t shoot this picture it was horribly lit, the wall was ugly and there was coffee cup lying on the ground. In the days of film I definitely wouldn�t have taken it just because of the lighting. However I was really intrigued by the composition so I clicked few images and then the work began. I created a total of 8 layers by cutting masks for the bike rack, the tire, the spokes, chrome parts, the green fork, the cables coming off the handle bar and the brake handle. I have a folder of different backgrounds that I�ve shot over the years, after trying a few in this image I settled on this black brick wall. 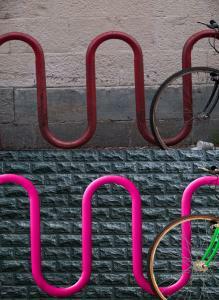 Next I worked on giving the bike rack some pazazz by playing with the color and giving it some shape. I achieved the roundness using the Bevel & Emboss and Contour tools which also enabled me to give a direction of light to the image. I used the same technique on the green fork to give it some shape and a direction of light. I wanted to give the spokes a little more definition and contrast by making them a neutral grey. The other layers were just minor color and brightness changes. There was a time where if the lighting wasn�t perfect I wouldn�t click the shutter, now I never pass up a great composition.